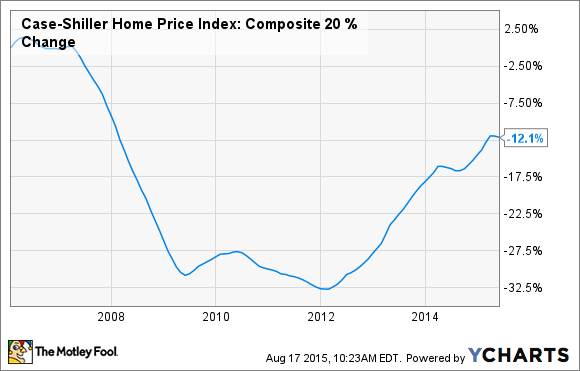 Even though home prices have gotten higher, it may still be an opportune time to buy. Home prices are up about 30% since bottoming in early 2012, but there are still compelling reasons to buy a home now. For starters, mortgages are cheap and relatively easy to get, the tax benefits of ownership can be fantastic, and it's getting more and more expensive to be a renter. With that in mind, if you're a prospective first-time homebuyer, here are seven reasons to consider taking the leap to homeownership in 2015. 1. 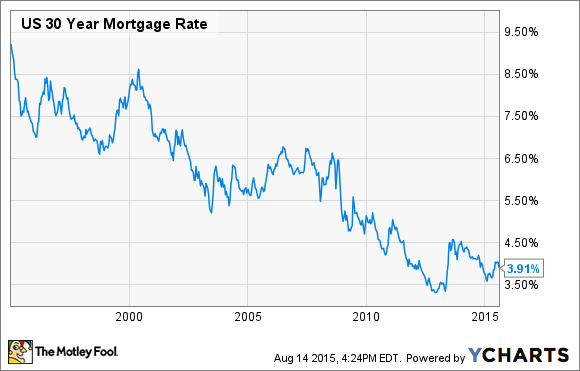 Interest rates are low, but for how much longer? With 30-year mortgages at an average of 3.91%, it's a historically cheap time to finance the purchase of a home. After all, it wasn't too long ago when 6% interest rates were considered "cheap." It is widely speculated that the Federal Reserve is about to raise interest rates as soon as next month, and it's entirely possible we'll see mortgage interest rates increase by a few percentage points over the next several years. Even if interest rates only rise by a small amount, it could still cost thousands more in interest. If you're toying with the idea of buying a home, it may be a good idea to take advantage of the current low rates. One compelling reason to buy is that it's getting expensive to be a renter. According to the latest data from Zillow, the median asking price of rental housing in the United States is $1,575 per month. Further, rent has been increasing faster than home prices, causing rental households to spend more of their income on housing than homeowners. According to recent data, the average renter spends 30% of their income on housing costs, while the average homeowner spends just over 15%. The median home value is $180,100 per month, which translates to a 30-year mortgage payment of just $852 (principle and interest) at current rates. Adding an estimated 1.5% of the home's value annually for taxes and insurance, this gives us a total monthly payment of $1,077 per month. Sure, you'll have some maintenance expenses if you own your home, but for $500 less per month on average, it's hard to make an economical case in favor of renting. Although the monthly payments are generally cheaper for homeowners, it's still appealing over the long run even if that isn't the case. Let's say you have two options. You could rent a three-bedroom apartment for $1,500 per month, or buy a house with a total 30-year mortgage payment of $1,500 per month. While this may sound like a toss-up, consider that rent in the U.S. has historically increased by a little more than 5% per year. So in, say, 10 years, you could expect your rent to increase to about $2,500 per month, while the mortgage payment will stay constant. And the longer you stay in your home, the better this benefit gets. By purchasing a home with a 30-year mortgage, you're essentially "locking in" your housing payment for the next three decades. Sure, taxes and insurance will increase somewhat over time, but not nearly as much as rent will. This is perhaps the most obvious benefit of owning a home. Over time, your mortgage payments will chip away at the principle balance and you'll own more and more of your home. If you buy a home with a $200,000 30-year mortgage, you'll end up paying back about $340,000 to your lender ($946 per month), including interest, at the current low mortgage rates. However, at the end of the loan term, you'll own the home free and clear. Your housing payments will end, and you're free to sell the home if you choose and put hundreds of thousands of dollars in your pocket. If you spend your money on rent for the next 30 years, you'll be left with nothing to show for it. There are several excellent tax benefits that come with homeownership. The interest you pay on your mortgage is tax deductible as long as you itemize. You could also qualify for tax deductions on your property taxes and mortgage insurance (if applicable). Buying a home could entitle you to a lower tax bill for years to come. Credit standards have relaxed significantly since the end of the financial crisis, and it's possible to obtain a conventional mortgage without a great credit score. A conventional loan can be obtained with a credit score as low as 620, and an FHA mortgage can be had with a score in the 500s. Not only are credit standards relaxing, but so are the upfront cost and other expense requirements. FHA loans have the same 3.5% minimum down payment as they've had for years, but the cost of FHA mortgage insurance has dropped significantly -- effectively making these loans more affordable. Meanwhile, Fannie Mae and Freddie Mac are now allowing banks to offer conventional mortgages with as little as 3% down. If you do some research, you could find even better products. For example, Regions Bank offers 100% loans to borrowers with strong credit histories. Although home prices have rebounded significantly from the lows, they are still about 12% below the pre-crisis peak. More importantly, the housing market is finally beginning to rise at a healthy (read: sustainable) pace once again. According to Zillow, home prices have risen by 3.3% over the past year, and they are projected to increase by another 2.4% over the next 12 months. These are in line with historic averages and are the first signs of a healthy housing market we've seen in a decade. In other words, prices are expected to gradually increase in the years ahead -- it doesn't look like it's going to get cheaper. While I believe now is a good time to buy a home, it's not the best move for everybody. If you want to maintain the freedom to move, or you don't plan on staying in the same place for more than a few years, it might make more sense to rent. However, if you have no plans of leaving your area and want to make a smart financial move for your future, buying a home is pretty attractive right now.